Quasicrystals form a new state of solid matter beside the crystalline and the amorphous. The positions of the atoms are ordered, but with noncrystallographic rotational symmetries and in a nonperiodic way. The new structure induces unusual physical properties, promising interesting applications. 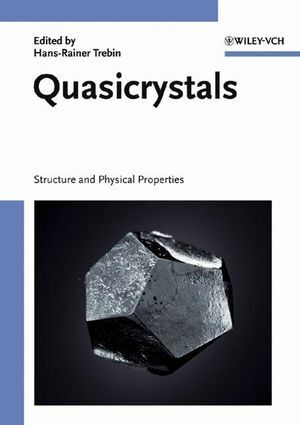 This book provides a comprehensive and up-to-date review and presents most recent research results, achieved by a collaboration of physicists, chemists, material scientists and mathematicians within the Priority Programme "Quasicrystals: Structure and Physical Properties" of the Deutsche Forschungsgemeinschaft (DFG). Starting from metallurgy, synthesis and characterization, the authors carry on with structure and mathematical modelling. On this basis electronic, magnetic, thermal, dynamic and mechanical properties are dealt with and finally surfaces and thin films. 1. Synthesis, Metallurgy and Characterization. 2. Structure and Mathematical Modelling. 3. Electronic and Magnetic Properties. 4. Thermal and Dynamic Properties. 6. Surfaces and Thin Films.